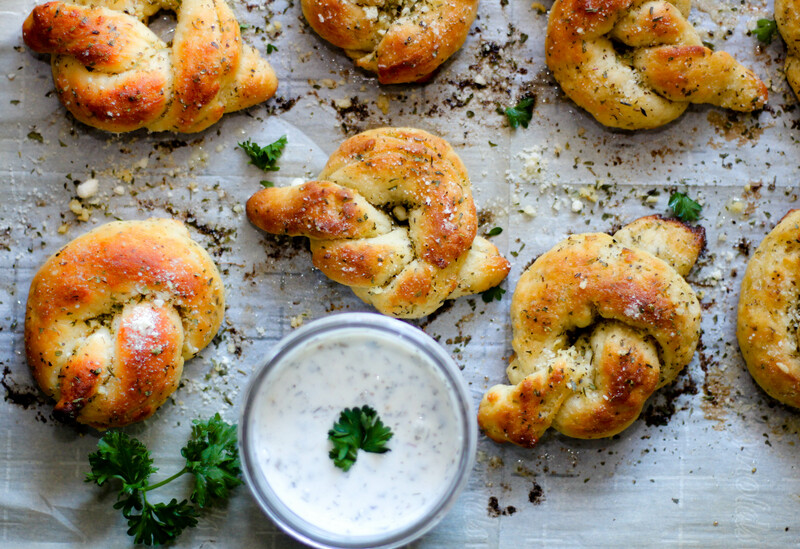 Weight Watchers friendly 2 Ingredient Dough Garlic Knots make the perfect appetizer for the big game or any time you want a little something doughy. Are y’all watching the Super Bowl this weekend? Now be honest, are you watching it for the game or food or Halftime performance or commercials. I’m not gonna lie, I’m watching it for the food, commercials and to spend time with my dad. 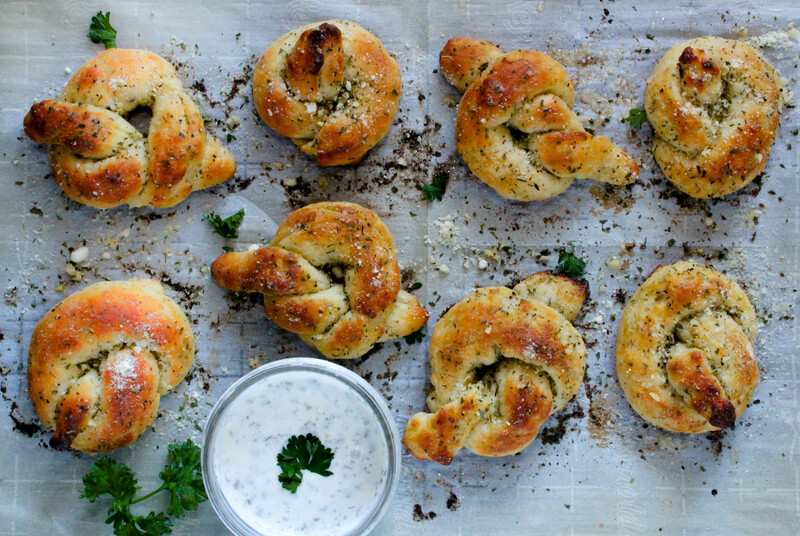 These 2 Ingredient Dough Garlic Knots are the perfect appetizer to watch the game. Growing up we always watched football games together and I love that we still do that to this day. He’s the reason I’m a Dallas Cowboys fan for life. Every Sunday during football season we were there on the couch and recliner watching the game together after church. We would leave breakfast early just to get home in time for kickoff. Dad was always so patient when I’d ask him questions of what was happening on the field. Even my silly questions like why do some of those guys have padding on their lower backs? Every Super Bowl I like to make little bites of food to eat throughout the game. Dad doesn’t have much of an appetite these days so I’m going lighter than usual so they don’t have a lot of leftovers. 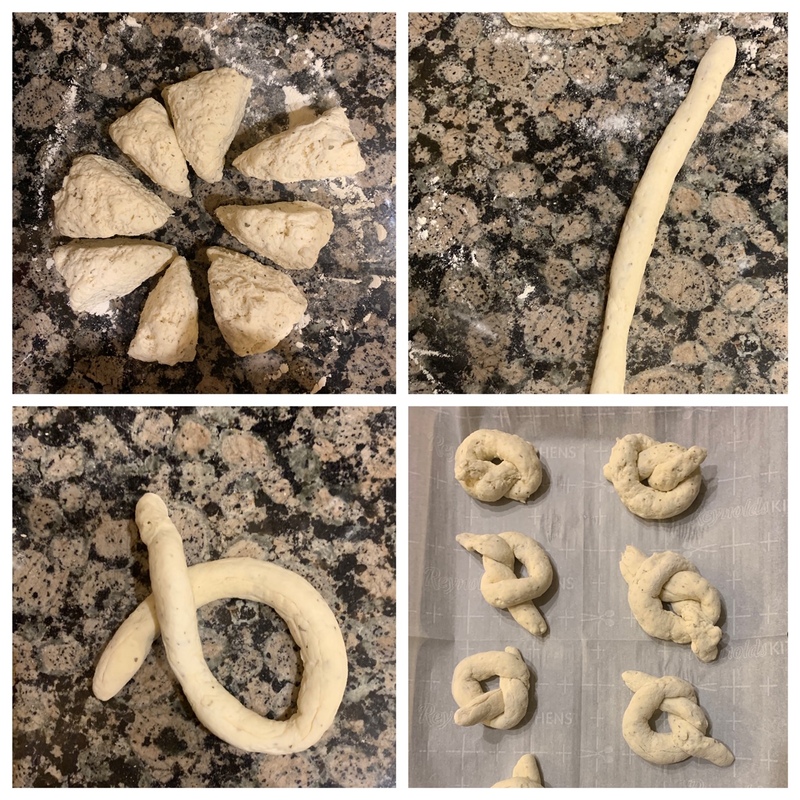 I’ve been making this 2 ingredient dough for a while now mostly because it is low in Weight Watchers points but also because it’s so simple to put together. You can make it with self-rising flour and leave out the baking powder and salt to achieve the same results and hence the 2 ingredient dough name. I kind of took away the low calories with all the butter I used but it is so worth it. I made these after having some amazing Garlic Knots when I visited the Pioneer Woman’s Boarding House. We picked these up at her P-Town Pizza while we were in town last month and I’ve been thinking of them ever since. You should definitely serve these with your favorite ranch dressing. Lately I’ve been using fat free Greek yogurt mixed in with some ranch dressing mix but for the big game I’ll probably get some ranch dressing from Mr. Gatti’s because it’s my favorite! Drain any liquid from yogurt. In a mixing bowl, add flour, salt, baking powder and 1 tsp Italia seasoning. Whisk together. Add greek yogurt and mix together with a spoon to combine. You will use your hands to finish binding everything together and knead to form a smooth dough. Cut dough into eight equal portions. Roll dough out into snake-like logs and then form into knots. 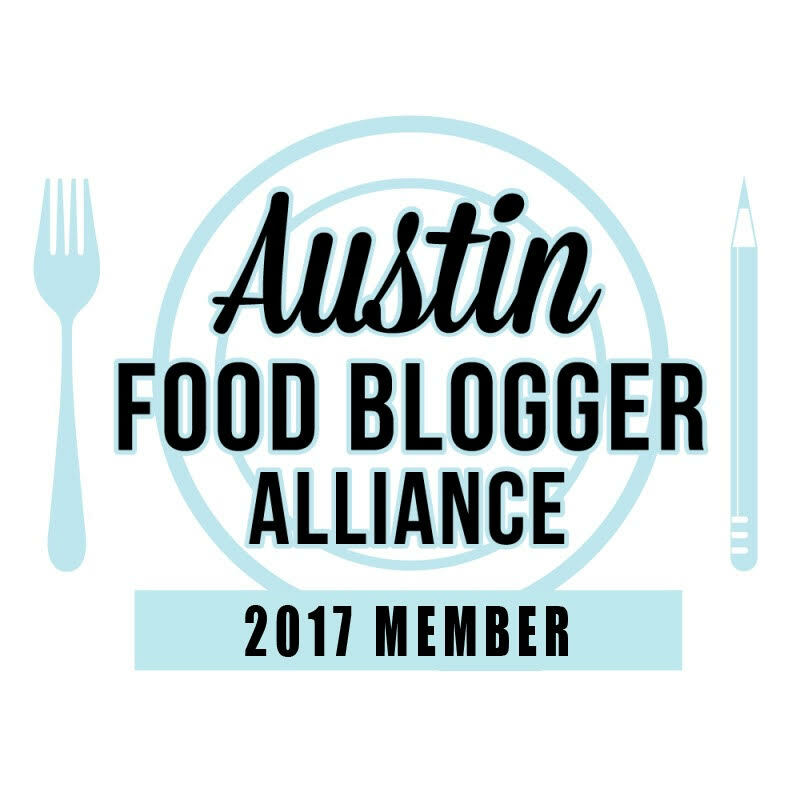 Place on a parchment lined baking sheet. Add 1 Tbsp melted butter with 1/2 tsp Italian seasoning and garlic powder. Mix together then brush on the knots. Bake for 13 minutes then increase temperature to 425 degrees then bake for an additional 2-3 minutes or until browned. 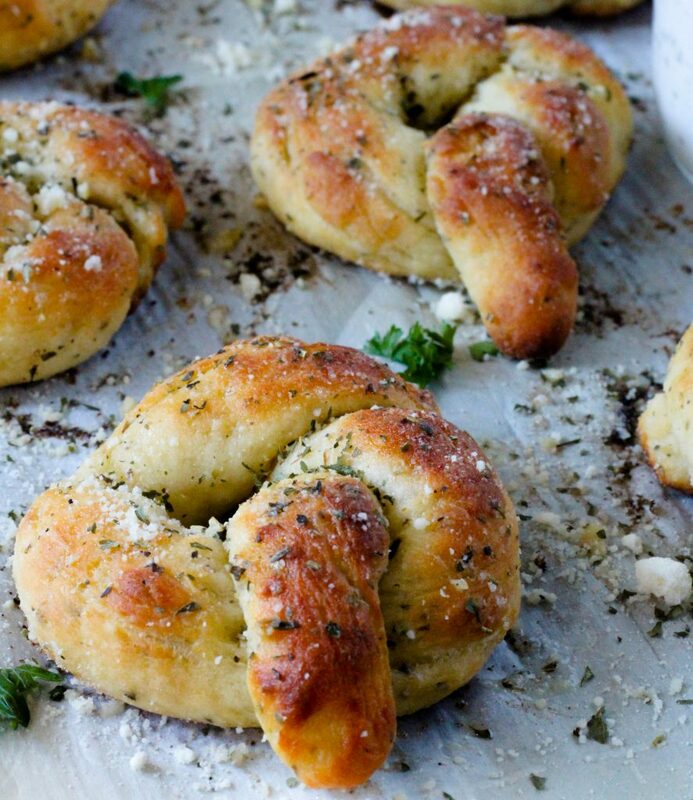 Once Garlic Knots are out of the oven, brush remaining melted butter on tops of knots and sprinkle with minced garlic, parsley and Parmesan cheese.